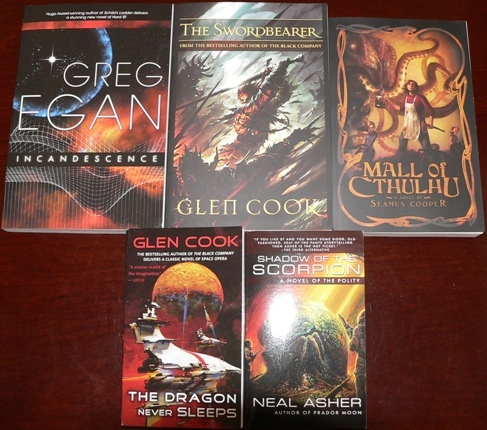 I’m pretty much interested in all of these, especially the science fiction, because I haven’t read any in a while. Dove right into the opening chapters of The Swordbearer. Already reading Canticle. 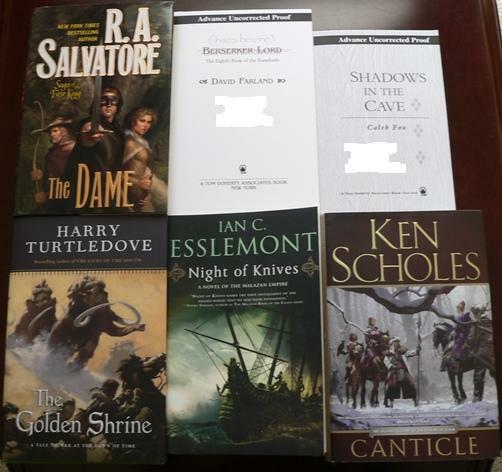 The Farland, Salvatore and Turtledove novels are books from series where I have not read the first novel. Of these, the Turtledove novel appeals the most. Probably because it’s only the second book in the series, but mostly because of the mammoths on the cover. I love ice age novels. I’ll have to hunt down the first book at the used book store. I’ve tried reading Night of Knives several times, but it hasn’t worked for me, at least not yet. There’s still time for me to do a useful review of it before the MM paperback comes out at the end of March. I am looking forward to reading Shadows in the Cave. I’m reading Vicious Circle. Demon Inside runs into too many of my red flags, but I’ll probably give Bitter Night a chance because I’ve heard so many good things about the author. 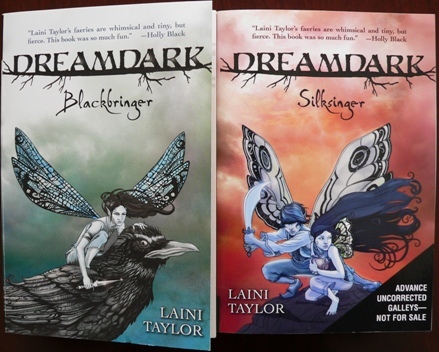 These look good and I’ve been reading Blackbringer. It takes place in Europe, told from the point of view of the fairy on the cover. I really like it, but the quirky dialog gets hard to read sometimes, plus other novels keep getting in the way. I’m also expecting Justin Allen‘s Year of the Horse in the mail. I’m amazed at how many of these author’s most obvious domain names are the victims of domain squatters. I guess I’m used to debut authors, who have time to get their hands on their domains before they are in demand. 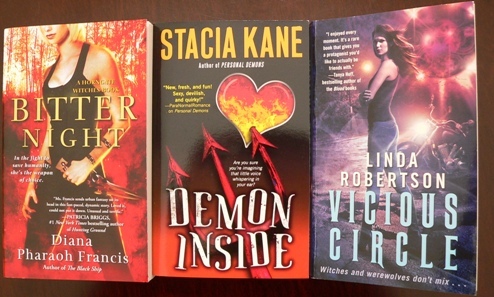 I went out looking for Burn Me Deadly by Alex Bledsoe at the bookstore, and the latest in the Maisy Dobbs mystery series by Jacqueline Winspear. I failed to find both, but a friend is going to lend me the Dobbs. I want to review it because the next book is out at the end of this month, and I figure there will be some interest in both books. Plus, I’ve been seeing Stephen King’s Under the Dome all over the place, and it really sounds good. Did any of these sound good to you? And that one really looks good too; I’ve already started sampling it. Which probably doesn’t make you feel any better! Ooohkay, so now I don’t feel so bad about my ARC stack! Thanks. I received BITTER NIGHT too, but unsolicited. If I receive a book unsolicited, it goes to the bottom of the stack unless it’s from one of my favorite authors. EEEEE!!! You got Cook books! I love Glen Cook. I had heard that a new Black Company book was coming out. Is The Swordbringer that book? And Salvatore was one of those authors who brought me into the genre. Do you know what series The Dame is part of? He’s written so many, and it’s been a couple years since I last read anything from him. Kimber, almost all of mine are unsolicited. I’m still very shy about asking for books! But I will if I want to do an advance review. Superwench, Night Shade sent me the whole boxful of books at once! Swordbringer sounds like a standalone novel; I have not read any of his books. But if you like them, I know I will. Chicory, I may have been jumping the gun on Burn Me Deadly. Deborah has not been able to find it either. And I didn’t know Magpie would be getting a love interest!! So far, it’s just been her and the crows. Now I must read on!! My step-daughter loves the Cook books, but I haven’t read them yet. It is frustrating when you go to the bookstore ready to plunk down money and are thwarted. Yes, I could have gotten something else, but I really did go specifically for that book, and I already have too many books on my TBR shelf (as you can see!) to be adding things that I don’t REALLY want to read. Hmm . . . that indy bookstore’s policy doesn’t sound very customer friendly. It’s not the indy store’s fault–more the way publishing is set up. They can’t place an order until they have a certain amount of books (I don’t know the number, and it probably varies from pub to pub). And they can’t be ordering a slew of extra books for the shop every time someone places a special order, just so they can put the order in right away. Mind you, if I’d been told it might take a couple of weeks, in this particular case I probably would have gotten the book elsewhere. But when they’ve ordered me things from suppliers, rather than direct from the pub, they’ve come pretty fast. Oh, well. Pout. I don’t even have an indy bookstore. The closest we have to that in this area is a truly humongous used bookstore that stocks about 5% new books. I do have a B&N, Borders and BAM within a 5 mile radius, so I ought not be too book-deprived.